We also have custom made wedding packages for Greek Orthodox wedding ceremonies. 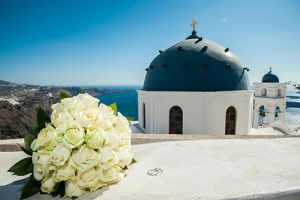 The wedding packages for Greece Orthodox weddings are for inside ceremonies as the local priests of Santorini are not performing ceremonies out side of the churches. 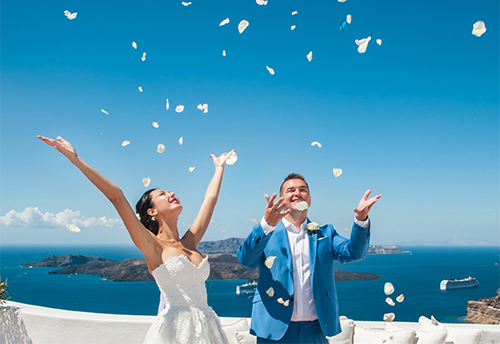 Santorini has always been an absolute favorite for overseas couples who want to get married in an amazing place. 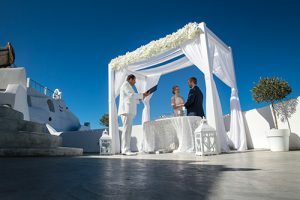 Santorini is one of the most beautiful Island in the whole world and as a local Santorini wedding planner I will inform you about the best wedding packages, flowers, wedding venues, reception act! 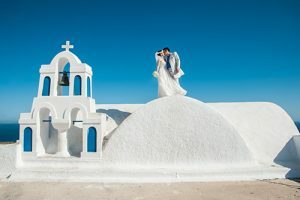 The picturesque whitewashed churches spread all over Santorini with their blue bell towers, the beautiful sandy beaches and the famous Santorini hospitality, make it one of the most romantic and unique locations in the world for your personal love Wedding story to unfold. 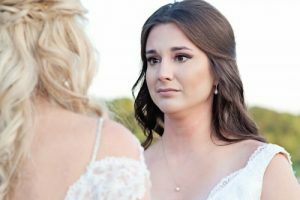 The ceremony is absolutely the most important element of your wedding. It is when you declare your intentions to one another. This will be one of the most touching moments of your life. We would like to help you make it more memorable and meaningful, primarily for you and also for your guests.